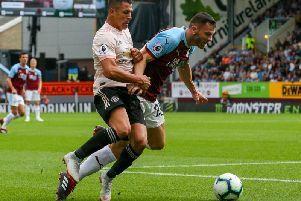 Kieran Trippier alluded to the profligacy of the Clarets after another blank in front of goal left the club on the brink of relegation from the Premier League. Michael Kightly’s 39th minute strike in a 2-2 draw against Leicester City at the King Power Stadium had ended a club-record stretch of 565 minutes without a goal earlier in the campaign. But the Clarets added four minutes on to that barren spell following the 1-0 defeat to West Ham at the Boleyn Ground to set a new unwanted record. George Boyd’s winner against Manchester City at Turf Moor in March proved to be Burnley’s last breakthrough, and their only goal in 819 minutes of football. “We haven’t had any luck but we can’t count on that,” said the defender. “We need to be more clinical in front of goal, as we’ve needed to be in the past couple. “The chances are there but we’re just not putting the ball in the back of the net to get ourselves goals and the points that we need. “Myself and a few others have created chances but maybe there’s been a good save from the keeper or whatever. We need to be more clinical in front of goal to get ourselves the goals and points we need! Michael Duff’s dismissal proved the turning point in the fixture against the Hammers, with Mark Noble compounding the misery when slotting home the resulting penalty in the 24th minute. “I thought it was a penalty at the time but to send him off, I don’t understand why he did that,” Trippier said. “But we carried on the game and kept on going. Even with 10 men we had a few chances when we could have got the equaliser but it wouldn’t go in for us. “It’s disappointing because with 11 men I think we could have got a result. Trippier added: “If you look at Leicester’s goal they got the result and it was the same on Saturday.